Open moorland towards the southern end of the Clwydian hills, comprising parts of Moel Gyw, Moel Llanfair, Moel Llêch, Moel y Plâs, Moel y Gelli, Moel y Waun and Moel yr Accre which extend outside Dyffryn Clwyd, improved pasture on less steep slopes accessed by modern farm tracks. 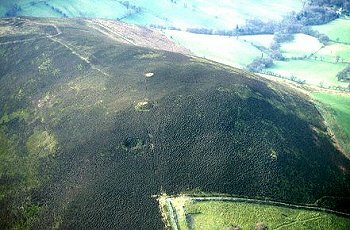 The earliest evidence of human activity is represented by a number of Bronze Age burial mounds including two at the head of the pass between Moel Llanfair and Moel Plâs, just west of Ty'n-y-mynydd, one of which is partly overlain by a more recent field boundary, one on the summit of Moel Gyw. The mounds are sited with clear reference to the local topography and may also have acted as territorial markers. The area falls within the ancient ecclesiastical parish of Llanfair Dyffryn Clwyd and along its boundary with the parish of Llanarmon-yn-Iâl further to the east. It also falls within the medieval commote of Llannerch, on the south-eastern boundary of the medieval cantref of Dyffryn Clwyd within the ancient Welsh kingdom of Gwynedd is-Conwy, which became the lordship of Ruthin after the Edwardian conquest of Wales. Upland, between about 200-447m above OD, with flattish summits and steep, predominantly west-facing slopes and gentler east-facing slopes, forming part of the Clwydian Range AONB. Stone outcrops along summit. From Moel Gelli southwards the Clwydian hills become lower and generally form a less distinctive ridge. The moorland is largely unenclosed and the area is therefore clearly defined from the enclosed farmland to the west. The majority of the boundaries defining the character area from adjacent ones are either relict hedges or post and wire fences. The eastern boundary, along the division between the parishes of Llanfair Dyffryn Clwyd and Llanarmon-yn-Iâl is formed by an axial dry-stone wall in places, as across the summit of Moel Plâs, dilapidated in places. The civil boundary where it runs across Moel Llanfair is represented by a post and wire fence, with some dry-stone walls separating the moorland from the farmland on the east, some of the boundaries here having been levelled and replaced by post and wire fences. The area is physically separated from the similar Moel Famau character area to the north by the pass which takes the main road between Ruthin and Mold. Steeper slopes, particularly on the western side of the hills are generally unimproved rough grazing, such as the western and southern slopes of Moel Llanfair, less steep slopes being generally improved grassland. Broad modern upland roads with deep erosion scars now form the most prominent artificial landscape features on the western slopes of Moel Gyw and the eastern and western slopes of Moel Llanfair. Some low relict field boundaries of uncertain date in the Boncyn Banhadlen area, on the north-eastern side of Moel Llanfair. The area is crossed by several partly unfenced east-west minor valley roads which are likely to be of some antiquity, and by part of the modern north-south Offa's Dyke Path. Telecommunications mast on Moel y Gelli.